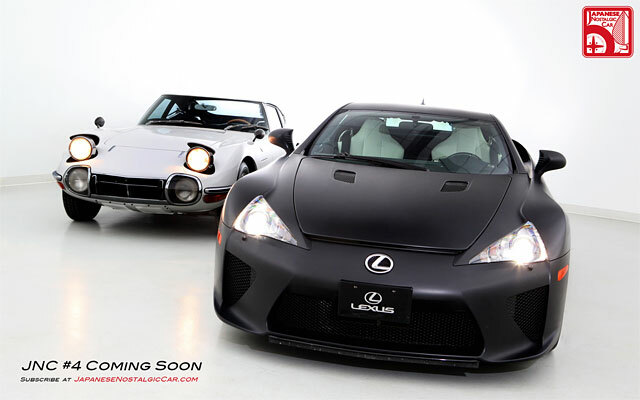 Like everyone else at SEMA, we drooled over the LFA at its US debut. As we stood there with mouths agape, the Lexus rep saw us holding a copy of JNC and exclaimed, “Hey, I love this mag!” We weren’t about to let an endorsement like that go to waste! We wrangled a 2000GT/LFA photo shoot on the spot and a week later we were in Toyota’s top secret unmarked warehouse somewhere in Torrance. Just awesome—as a huge James Bond fanatic, the 2000GT has long been one of my favorite sports cars. I would love to see more photos from this shoot.